Did you know traditional French mendiants represent the colours of monastic orders in the Middle Ages? And in Spain they’re known as bombones músicos? More chocolate history later. For now I’ll just say these traditional Christmas treats are delicious, creative and adorable! 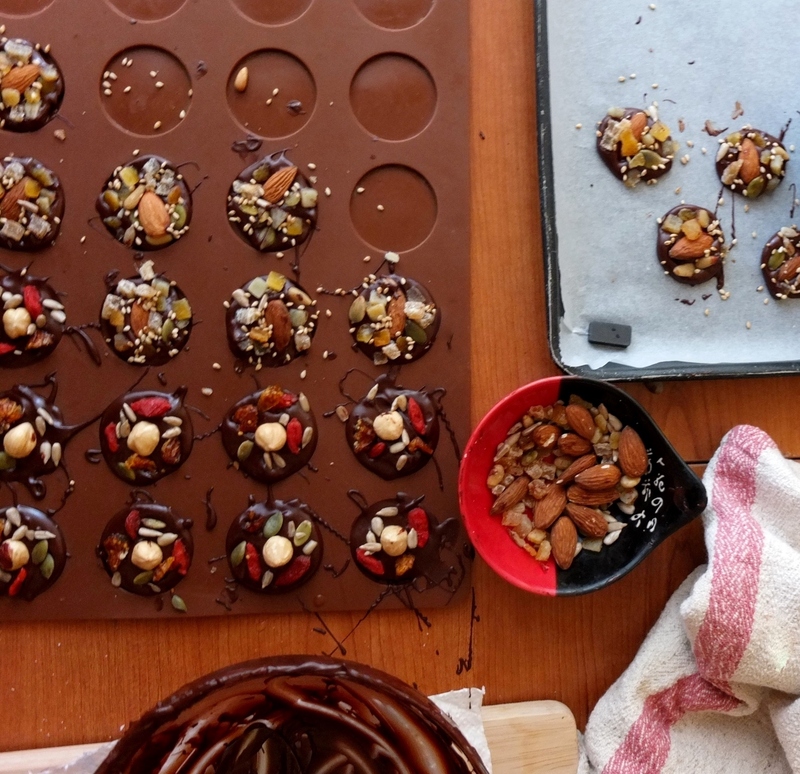 You’ll find chocolate mendiants in pâtisseries but the recipe’s so easy you can make them with kids. Hurray! 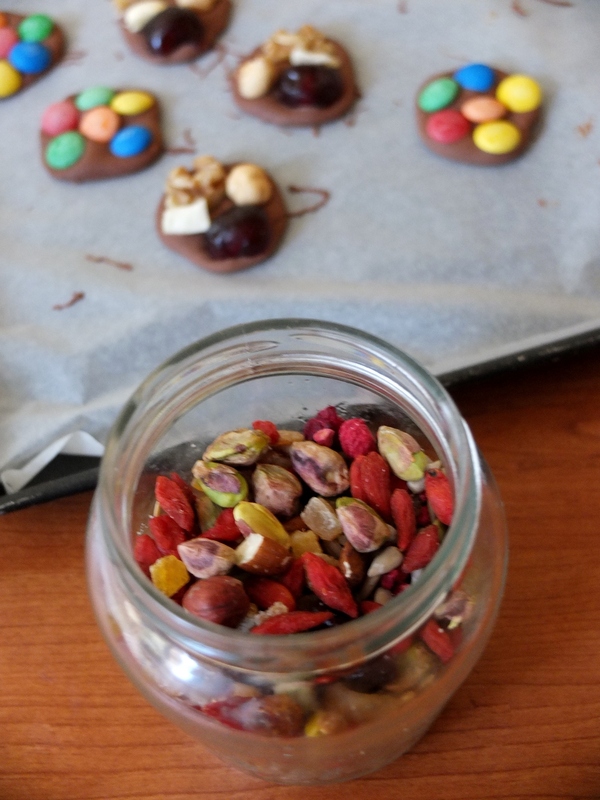 I had fun designing special mendiants with nuts, dried fruit, seeds and m&m’s for everyone, including children and the health-conscious. You combine your elements to fit on small chocolate discs so it’s handy to think up designs in advance and maybe sketch them, even if later you don’t follow the plan exactly. 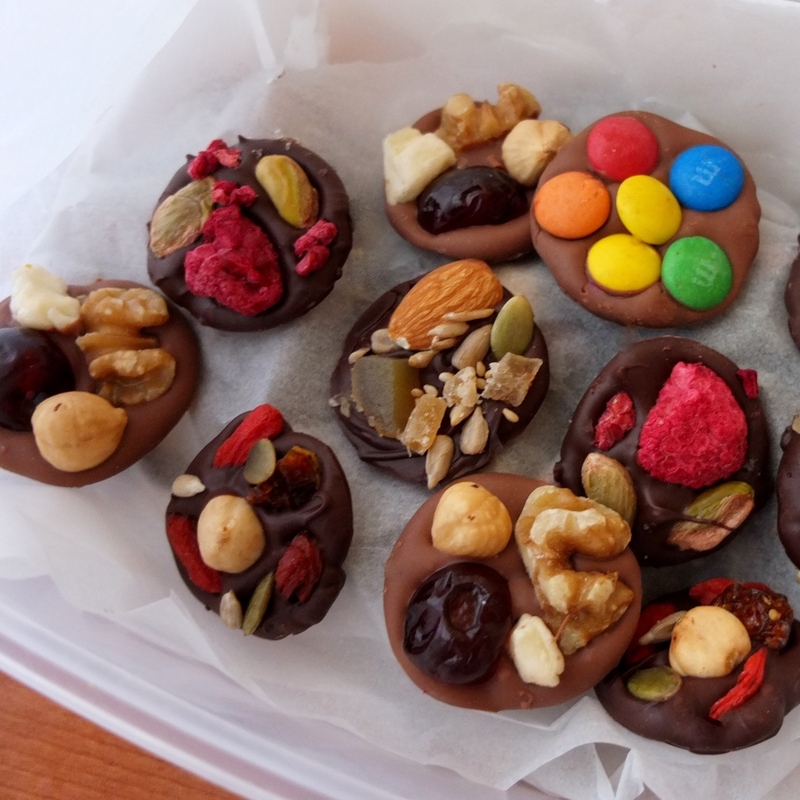 Line up your bits and pieces ready to place rapidly on the chocolate discs before they cool and harden. Use good-quality chocolate. If your chocolate is old and has seen extreme temperature changes it may not look great or temper well. My old white chocolate clumped up so was replaced by dark chocolate, which can be 55% if you want it less bitter, to 70%. 250g/9 ounces makes around 30 to 35 mendiants (diametre 4cm/1.5inches). 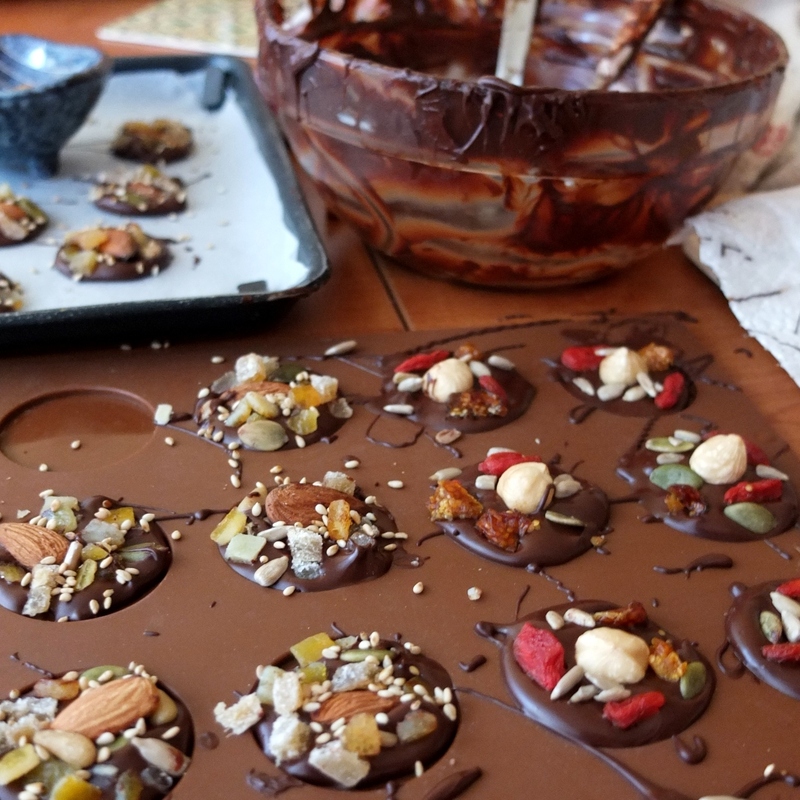 When all your toppings are ready melt the chocolate slowly on a bain marie. 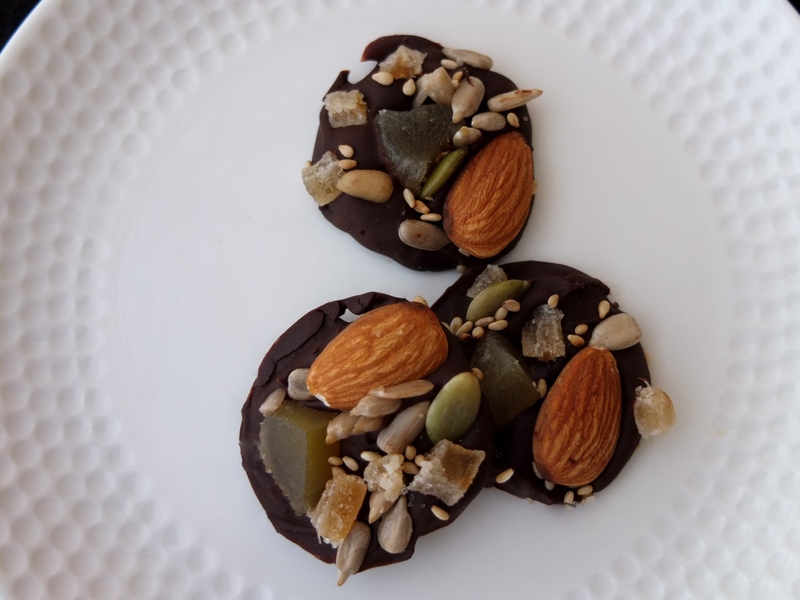 If you’re eating your mendiants within a few days there’s no need to temper but follow my instructions on my tempering chocolate page if you’d like to. 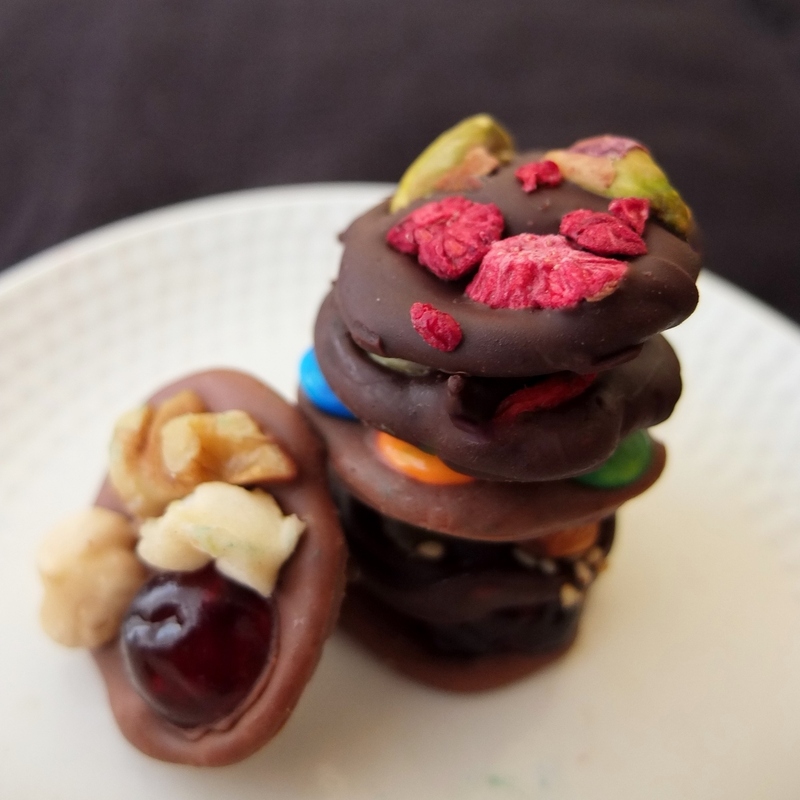 Place little rounds of chocolate on baking paper or a mould with a teaspoon or tablespoon. A macaron mould helps keep sizes similar. 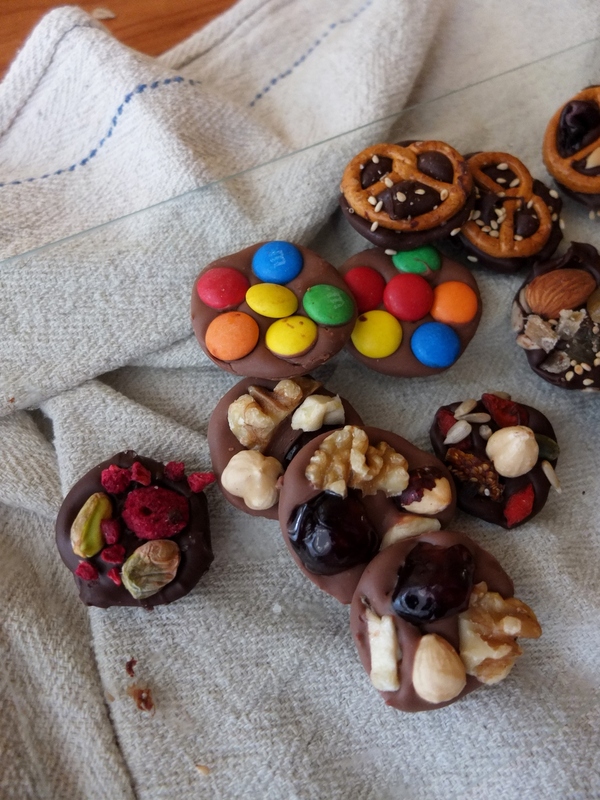 Then carefully place the bits and bobs on top and the chocolate will spread a little. Let your mendiants set then store in the refrigerator in airtight tupperware with waxed or greaseproof paper between layers. 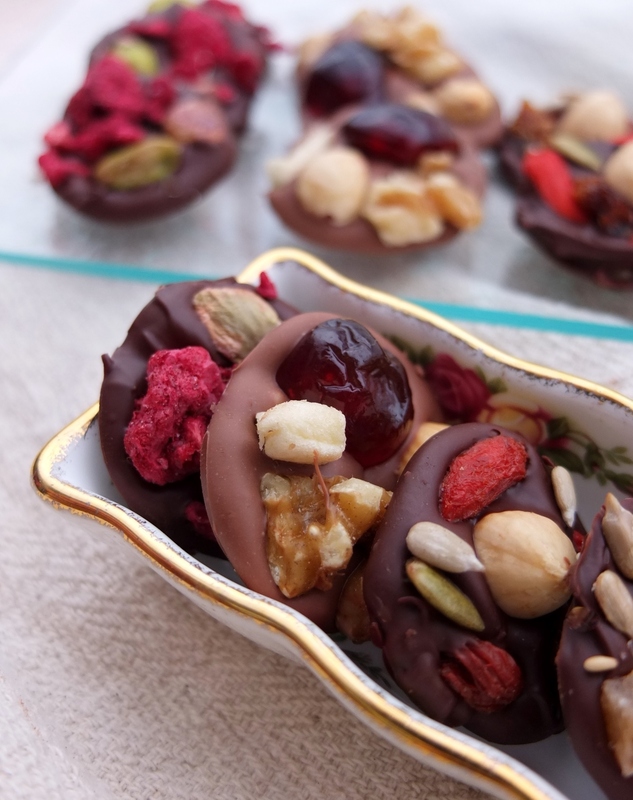 To set quickly (or if you’re in a hot place) pop them in the freezer 20 minutes. The French and American mendiants were my least favourite. 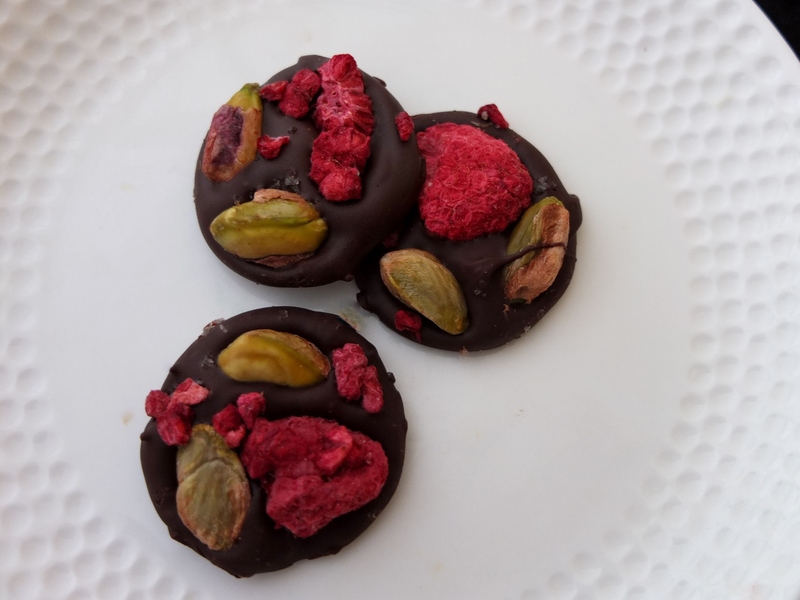 The ‘French’ raspberries and fleur de sel were at odds with each other and so powerful the pistachios were eclipsed. They were elegant mendiants but might work better with sweet white chocolate as originally planned, to soften the dehydrated raspberries’ intense flavour. 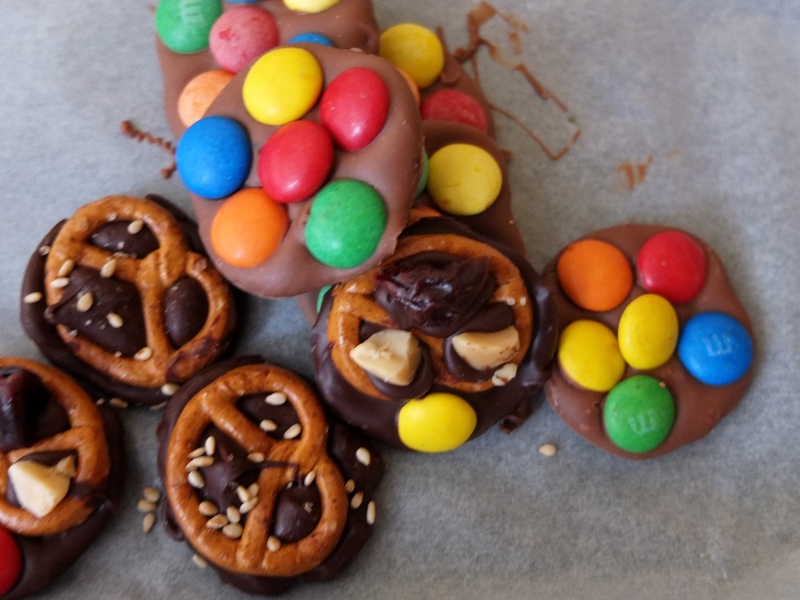 The American spelt pretzels are tasty but lose some crunch and it’s difficult to position other ingredients around them in an attractive manner. On the positive side the Lacasitos or m&m’s add a great crisp sugar-coated crunch to the Spanish mendiants. Simple but effective. Surprisingly they’re my favourites along with the British mendiants. Maybe I’m in the mood for milk chocolate or have inherently British and childlike tastes. The British ones remind me of Cadbury’s fruit and nut bars. Yum. There’s a good balance of walnut and hazelnut to fruit. Next time I might try replacing the apple with dried apricot. 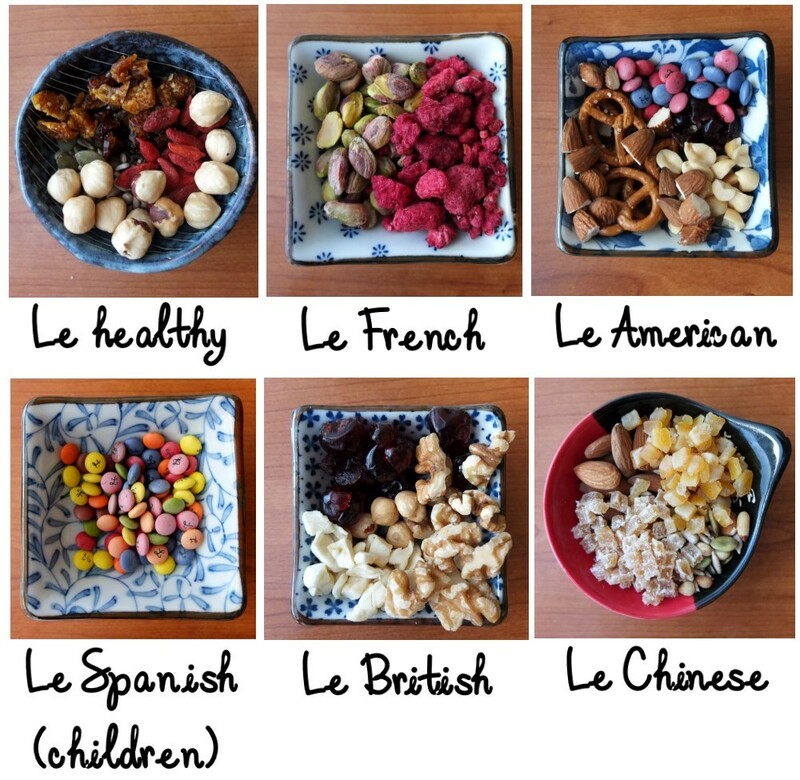 I also adore the Chinese and Healthy mendiants, with a lovely mix of nuts, seeds and tanginess. Very tasty! I love the ginger in the Chinese ones. Though I did overload them so they lost elegance. You can keep leftovers in a jar as an energy mix. 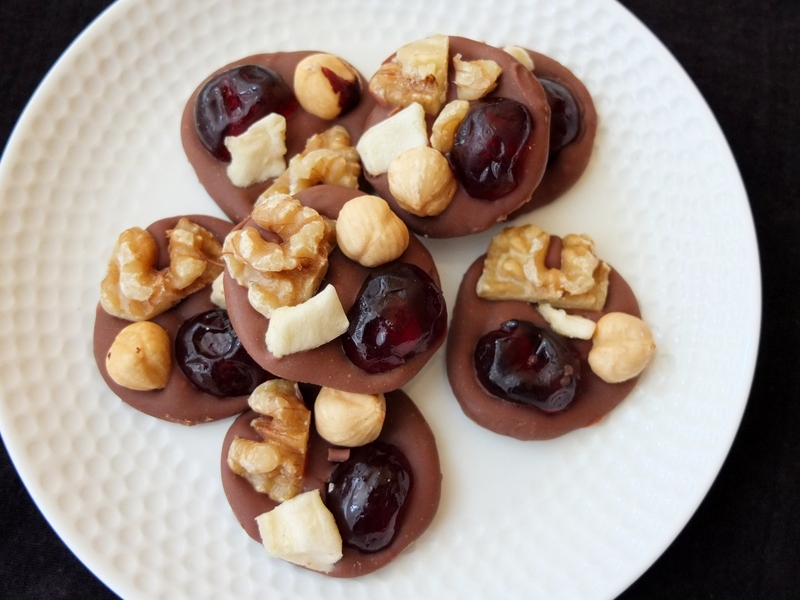 I’ll try making the chocolate discs slimmer and loading some of them up less next time. But which mendiants would you make or design? 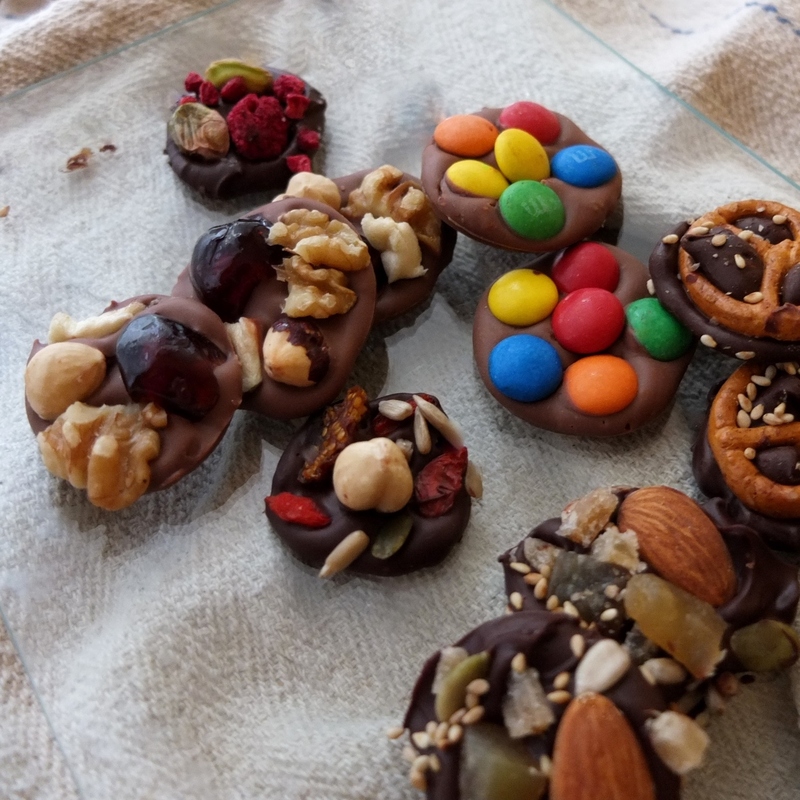 Can you suggest another country or mix of ingredients? 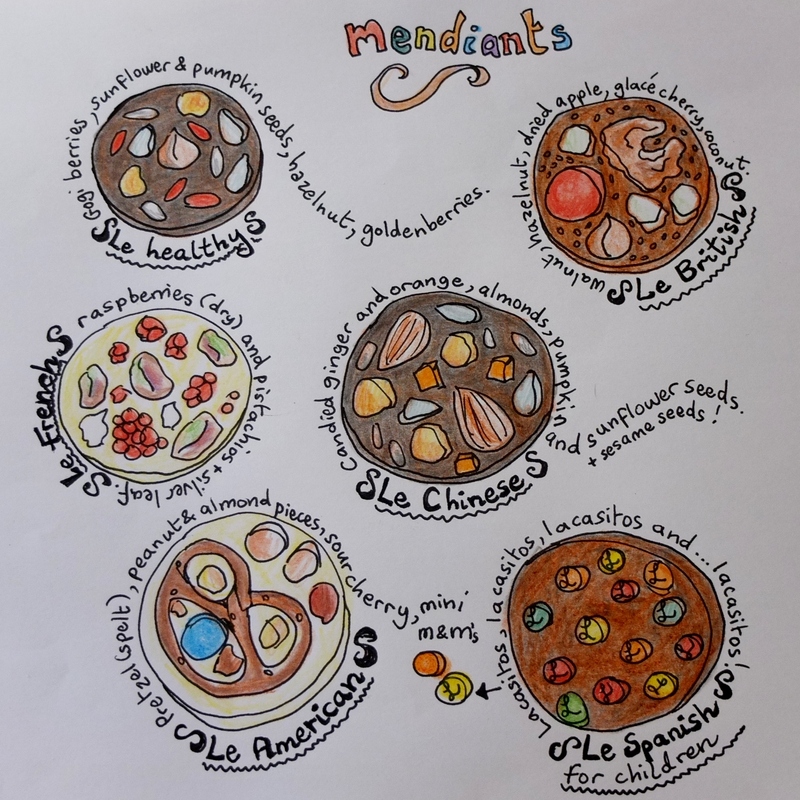 The original mendiants are made with a combination of dried fruit and nuts that represent the colours of mendicant or monastic orders, depending on others’ charity to survive. Mendiant is French for beggar or begging. Classically there’s raisin for the Dominicans, hazelnut for the Augustins, dried fig for Franciscans and almond for the Carmelite. But nowadays there are many variations of mendiants. In Spain there are the extremely similar bombones músicos or de músico. It’s not easy to trace their origins online but it’s possible they came from France. Why are they called músicos (musicians)? El invitado de invierno has a recipe for a dessert postre de músico and says the name may have originated from a village custom of giving presents of homemade dried fruit to travelling musicians. One thing is sure though. 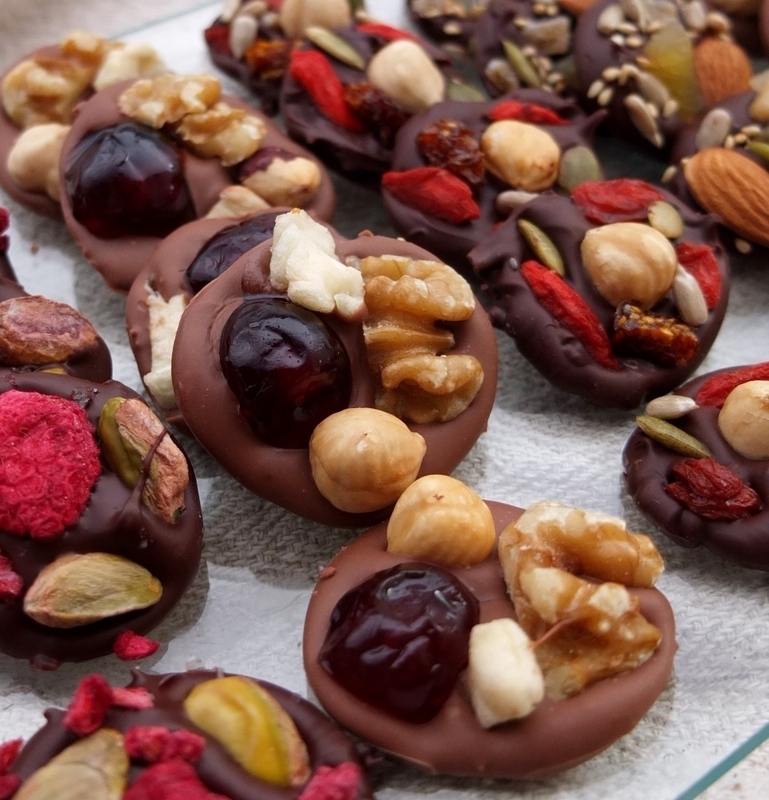 These chocolates make lovely gifts and can be taylor-made for the recipient to contain their favourite things! And getting children involved in making them is a lovely idea. Mendiants don’t have to look like they came out of a pâtisserie! 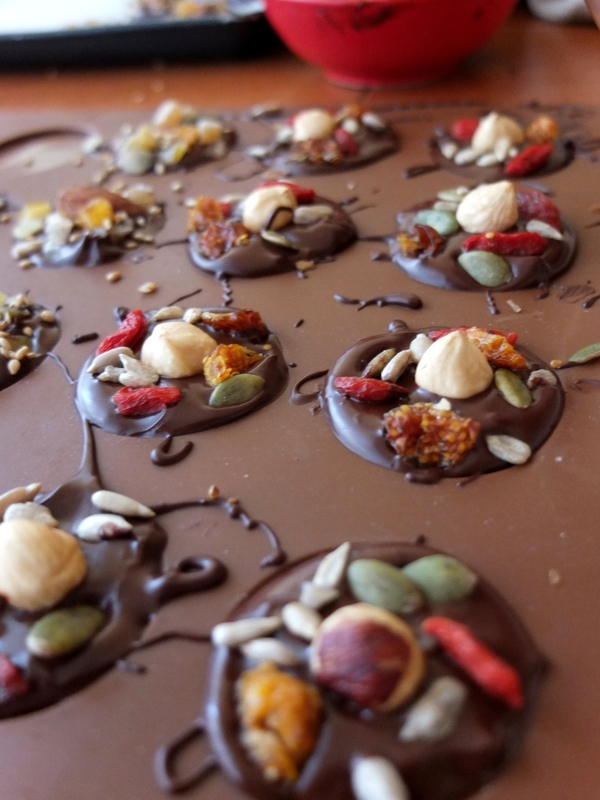 So they’re charming and practical chocolates, with a ‘superfood’ version if that’s your thing. Do please have a little chocolate mendiant or two. They’re made from chocolate so they’ll make you very happy! 🙂 I confess I had a few for breakfast and am feeling rather mellow now. Ahem. 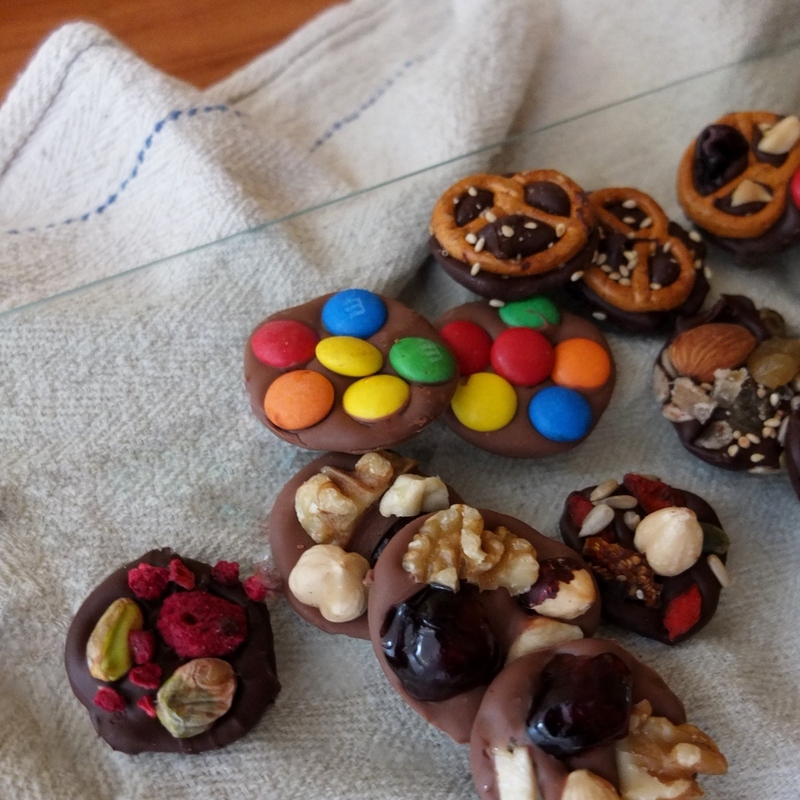 Lili, It’s so fun to see what can be done with chocolate. I have a dream that I go Europe and work for a chocolatier for a month! I knew someone ages ago who went to a patisserie to learn to bake! I wonder where I could find that macaron form? Thanks Lili! I’ll check it out! I have been wanting to make these for so long, but would never have come up with so many flavor combinations! They look so inviting 🙂 I think I will go make one for myself now. Cranberry and almond sounds like a really lovely combination – love tart cranberries 🙂 Brilliant that they were delicious, think I’ll try your version too! Did you use dark or milk chocolate? I am a dark chocolate person all the way!